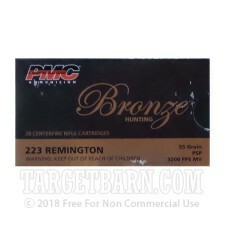 Looking for a cost-effective varmint or small game load for your .223/5.56 NATO rifle? 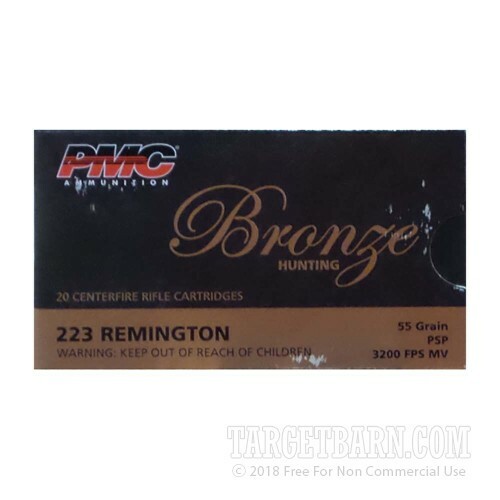 This .223 Remington ammunition from PMC will get the job done. Each cartridge in this 20-round box fires a 55 grain pointed soft point bullet at 3,200 feet per second. This results in good expansion against game but also external ballistics comparable to common M193-spec range loads--a particular benefit if your rifle has optics mounted. PMC ammo is loaded in South Korea using non-corrosive Boxer primers and reloadable brass cases.